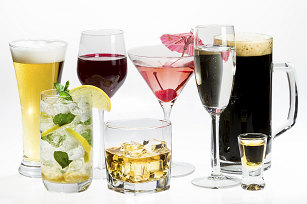 People experience more alcohol-related consequences when consuming alcohol mixed with energy drinks (referred to as AmEDs) compared to when drinking alcohol on its own. The stimulant properties of energy drinks could facilitate heavier and longer bouts of drinking behaviour, either through pharmacological means or via people's expectancies that stimulants should change the depressant effects of alcohol. The present study focused on this latter idea. We modified a psychometrically validated measure about the effects of alcohol to assess people's beliefs about the effects about AmEDs. In a large sample of undergraduates, we then examined whether beliefs about alcohol differed when additionally consuming energy drinks. We also examined whether beliefs about AmEDs were associated with how much and how often students consume AmEDs. We found that our new measure was structurally valid. We also found that students generally believed that the effects of drinking alcohol on its own were similar to the effects of drinking AmEDS, except that people expected to feel less calm, mellow, and relaxed when drinking AmEDs compared to when drinking alcohol alone. This finding was more pronounced for the ascending limb of the blood alcohol curve (getting drunk) as opposed to the descending limb (sobering up). Similarly to when drinking alcohol alone, we found that undergraduates drank more AmEDs when they expected to experience greater degrees of highly valenced positive effects (e.g., fun, liveliness, talkativeness, confidence, and happiness), but lower degrees of mildly valenced negative effects (e.g., feeling wobbly, wozzy, dizzy, or ill). Unexpectedly, we also found that undergraduates who expected stronger low arousal positive effects (e.g., feeling relaxed, calm) reported drinking greater typical and maximum quantities of AmEDs. Our findings suggest that undergraduates may not drink high quantities of AmEDs to achieve calmness, but end up consuming many AmEDs because they believe that energy drinks will delay this effect. This belief, coupled with believing that AmEDS will result in having lots of fun, while not feeling very intoxicated, may serve as risk factors for consuming lots of AmEDs during a single occasion. This may then increase students' chances of experiencing adverse alcohol-related consequences.